One of my neighbors, I’m not sure which one, believes that the tiny birds in our communal backyard will enjoy huge crusts of French bread that would suffocate a goose. We live in an apartment complex and share this backyard with a lot of people we rarely see. 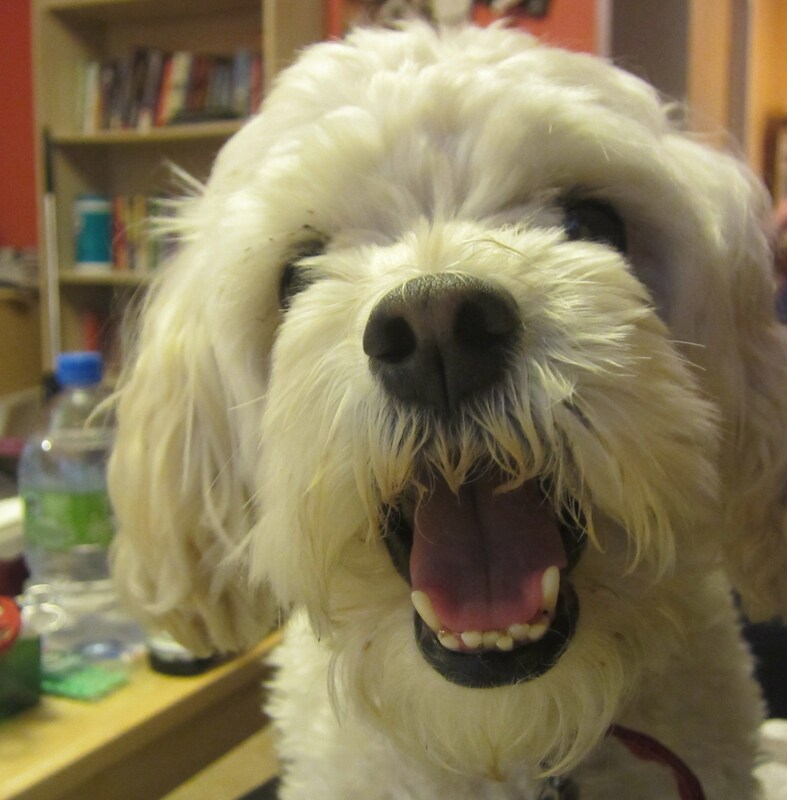 And Cricket makes sure to bark at anyone who dares to be outside, so I feel bad complaining about anyone else’s foibles. But the scattering of bread felt like a field of landmines to me. 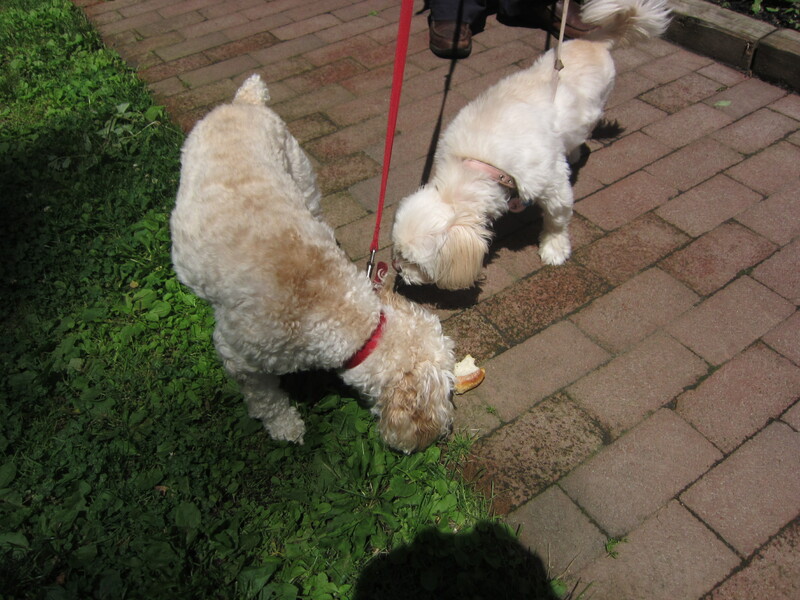 The last time the French bread was thrown out into the backyard was over the winter, when we discovered that my other dog, Butterfly, is diabetic. 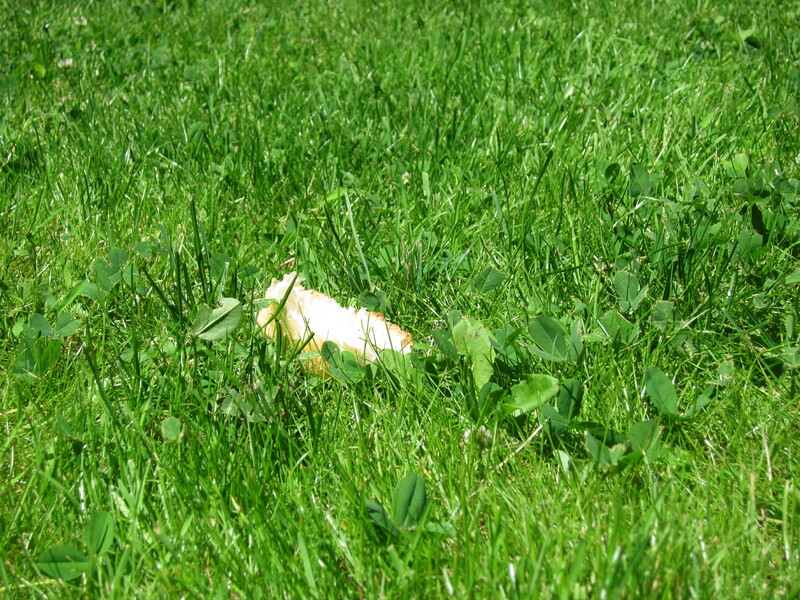 The bread in the grass. 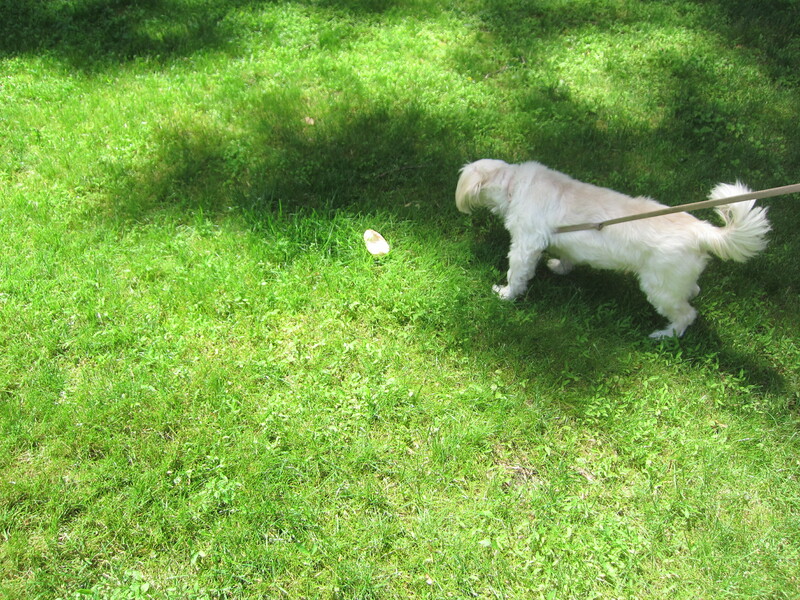 Putting white bread in front of Butterfly would be like leaving bowls of whiskey in front of an alcoholic dog. Butterfly loves the food she’s allowed to eat. She loves her chicken treats and kibble and chew sticks. It’s just that, if I am sitting on the couch eating a piece of pizza, she will stretch until she can reach the pizza and try to chew off the side of the crust. She is very short, but white flour gives her magical powers. Cricket was interested in the bread too, but not more than she was interested in the squirrels, and the birds, and the sticks. When I pulled Cricket away from a piece of the bread, she basically shrugged and said, “whatever,” and moved on to try to rip my arm out of the socket as she ran towards a squirrel who was already miles out of her reach. Of course, my first thought when I saw the bread scattered on the lawn was to do a blog post about it. So Mom brought her camera and I brought the girls and we had to pose Butterfly close enough to the bread to show the temptation, but not so close that she could actually eat the bread. Of course, she gobbled a piece down before I could pull her away. I don’t know what to make of my behavior here. I was worried about Butterfly being tempted by the bread and falling into a sugar coma and dying in front of me, and yet, another part of me just kept thinking – blog post! The bread was gone by the end of that day, and it hasn’t returned. I have no idea who was tossing the bread out there, but it’s possible that they were watching me and Mom and the girls out on the lawn feverishly trying to get pictures, and decided to scoop the bread back up. Or, the maintenance guys saw the bread and grumbled about how they could possibly mow around these stupid obstacles, and picked them all up and threw them in the garbage. I didn’t even realize how anxious the bread gauntlet had made me feel until it was gone. 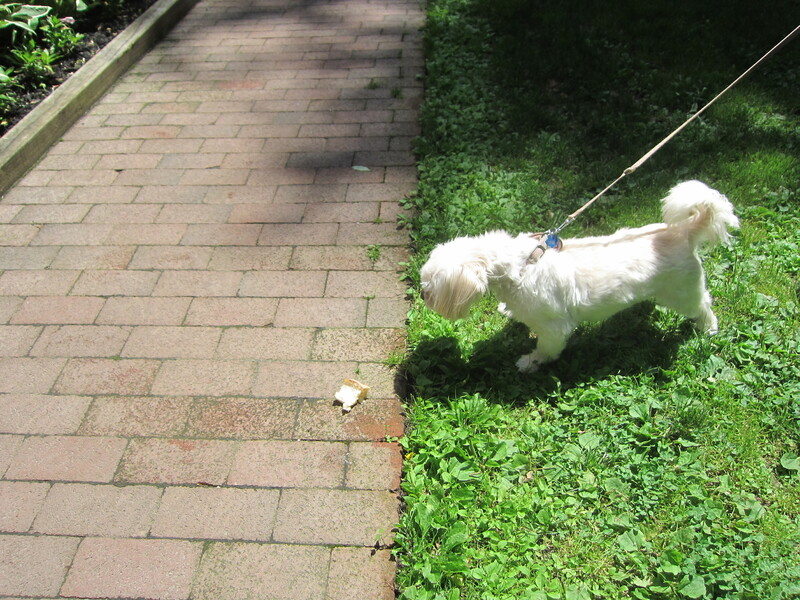 Not having to grip Butterfly’s leash in a fist made the bread-free walk, even in the heat, almost blissful. And yet, I almost wish the bread gauntlet, with its connotations of manna from heaven, would return. I don’t want Butterfly to get sick, but the glee on her face when she sees those magical pieces of bread is overwhelming and, selfishly, I want to see that look again. Is there such a thing as low sugar manna from heaven? 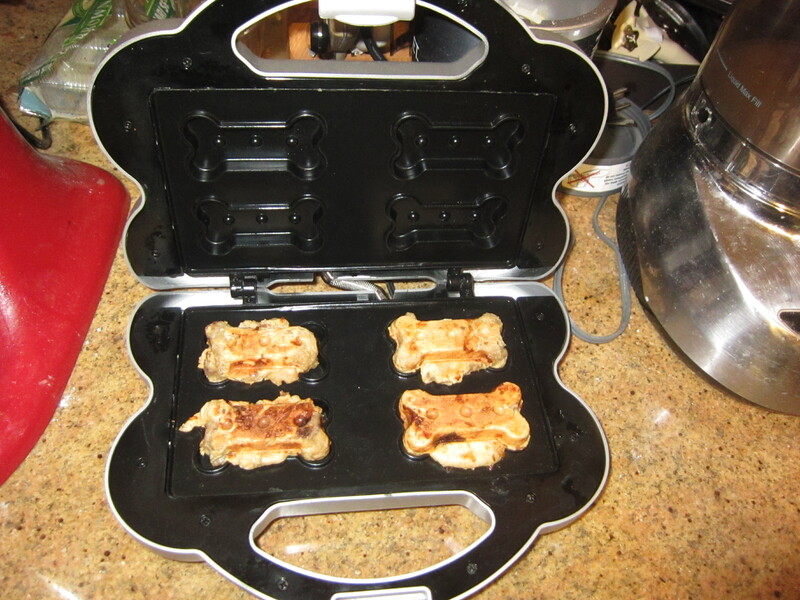 Posted in dogs, memoir and tagged bread, diabetes, dogs, heaven, magic, manna, memoir, pets. Bookmark the permalink. I had a writing teacher once who said we should never write about dreams, or menstruation, or school, or coming of age, or drugs or…he had a long list. But the dreams were verboten because, he said, your dreams will only be interesting to you and no one else. I hope that’s not true. At the simplest level, things you see during the day can show up in your dreams; a character on a TV show, a wheat field, a cow, a striped shirt. And maybe it’s significant and maybe it’s not. It’s just something you noticed that day. This happens when you write fiction too. You need a location or a character and, consciously or unconsciously, you grab from details you saw that day, a hat someone wore on the subway, a dog in a pet store window, a car, a smell, a song, a sound. But we also dream about the things that trouble us, things from the past or the present or a jumble of the two. Our old stories get reset in new locations, or new stories get stuck in the labyrinth of the old places. I tend to have a lot of bad dreams set at the house I grew up in, and an inordinate amount of dreams about serial killers, but the most upsetting dreams I have are about puppies. I started to do dreamwork for therapy when I was still in college. My book of Genesis at my Orthodox Jewish high school had one or two lines from the actual book on each page, with paragraphs from different commentators picking apart each word and offering every possible interpretation and interpolation one could think of. So that’s what I did with my dreams. I wrote down everything I could remember, as soon as I woke up, and later, I’d copy the dream into a special notebook, and write down my general impressions, and then do a line by line exegesis. One dream could take up ten pages of college ruled paper. But with these puppy dreams, no matter how much work I put into the interpretations, the dreams stuck with me. I could put aside a serial killer, a flood, a crashing airplane, a car flying off the side of a bridge, but squashed puppies haunted me, not only for the rest of the day, but for weeks, and months. 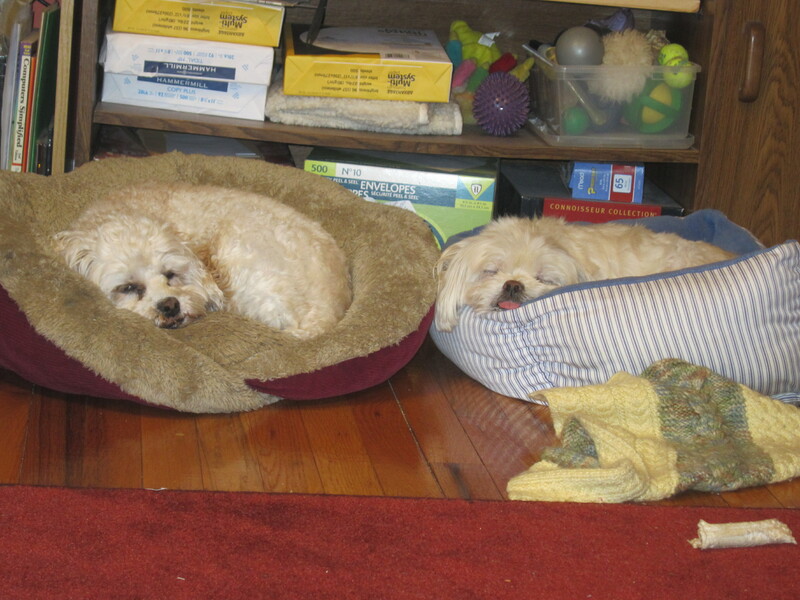 Sometimes the puppies in my dreams were as small as mice, and hairless and pink, and sometimes they were barely formed and looked like pieces of raw chicken cutlet, or balls of play-doh. 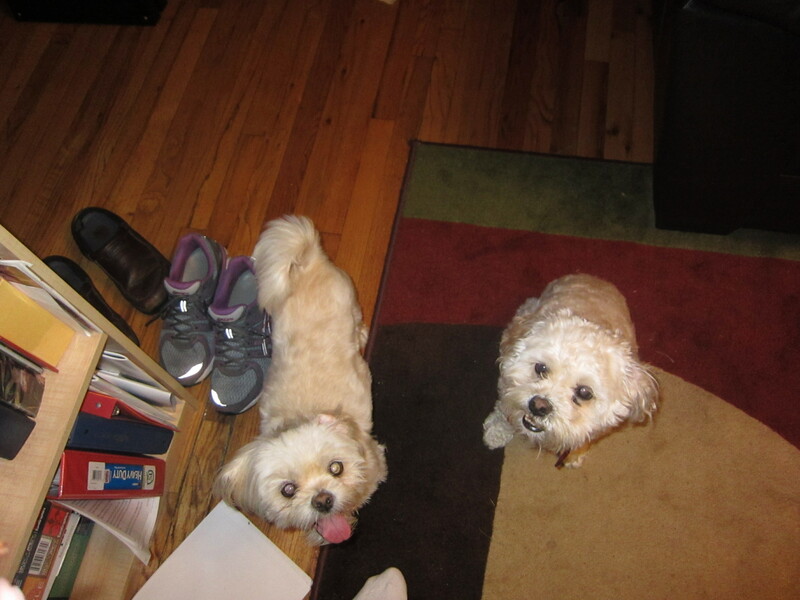 The puppies seemed to represent the deepest, most real and identifiably ME parts of me. As if I were made of puppies, as if I am a stringing together of puppies inside rather than the usual human organs. There was the dream when the puppies surrounded me in a circle and I kept tripping over them and squashing them by accident until I couldn’t move in any direction. There was the dream when the lead puppy of a pack pointed a tiny machine gun at me and told me it was all my fault, without specifying what “it” was. 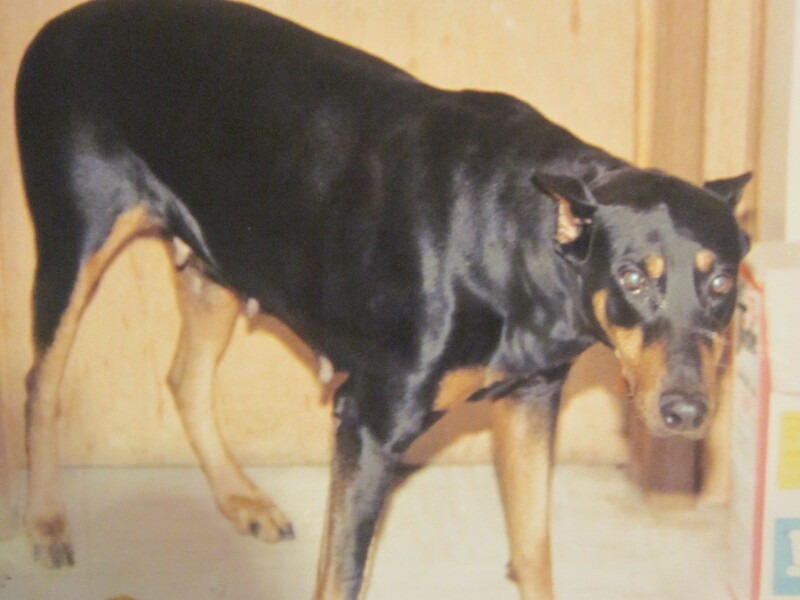 When my Doberman Pinscher, Delilah, gave birth to her first set of puppies, I was seven or eight years old and there to watch their birth, early in the morning, with the sun streaming in through the kitchen windows. Each puppy came out in it’s own sac and Delilah carefully licked them free and set them on their feet to wobble about and figure out how to walk on solid ground. Delilah, ready to feed the puppies. 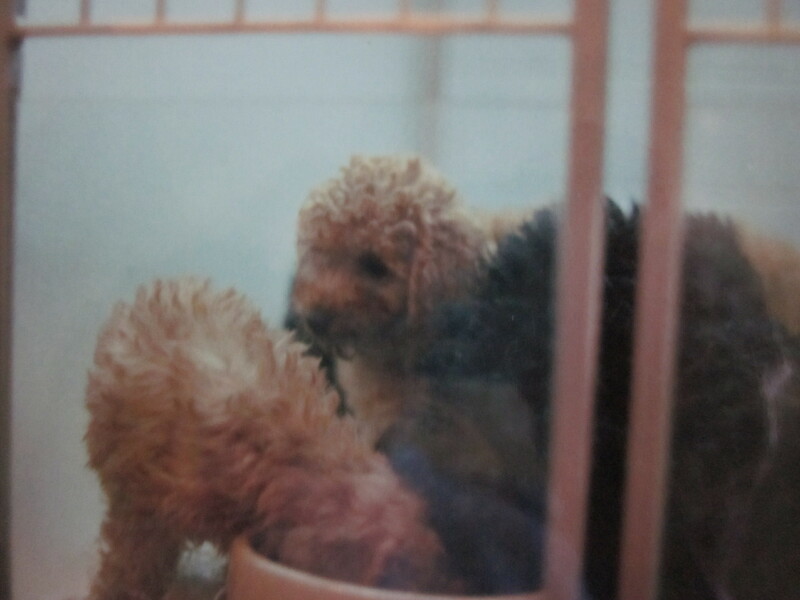 I loved those puppies. I brought a handful of them to school for show and tell, and put another handful in a basket to carry up to my room. 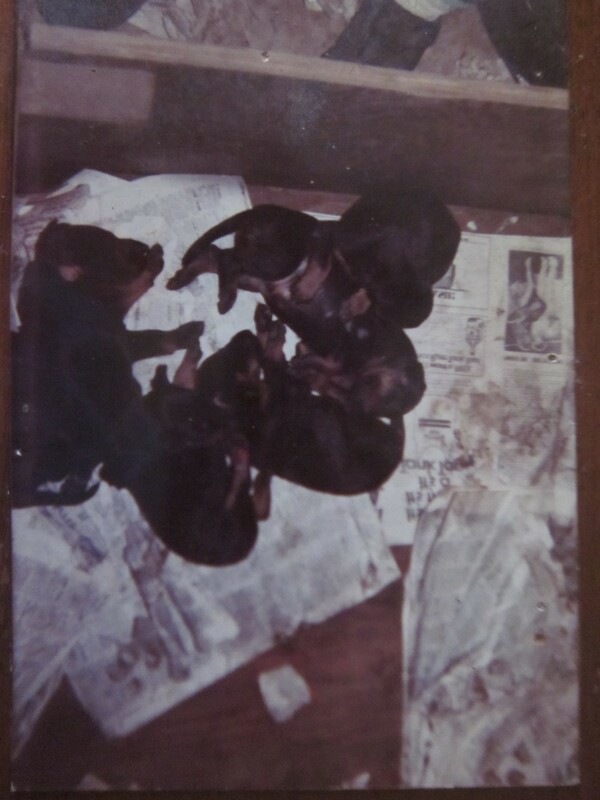 I got used to the overriding smell of puppy poop mixed with newsprint and sawdust, from their puppy box in the basement. 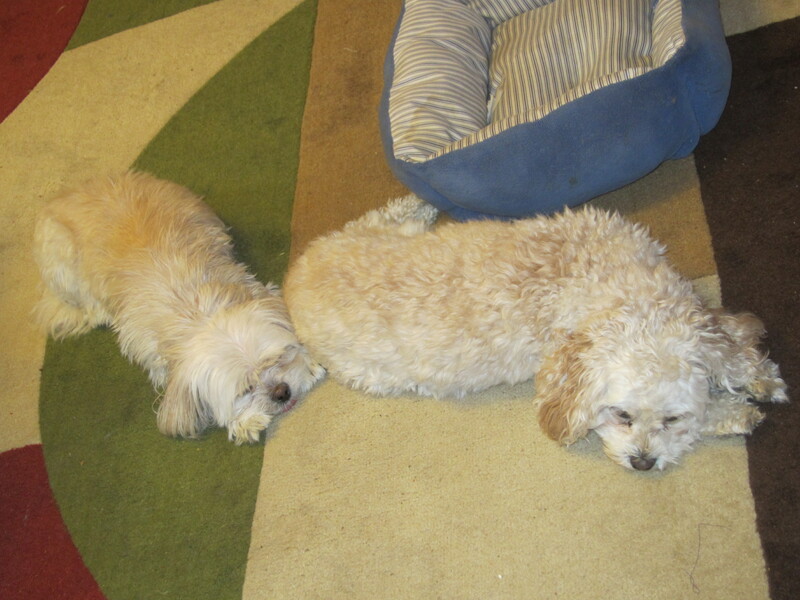 We had two sets of puppies for seven or eight weeks each, and I guess that gave them time to imprint on me. 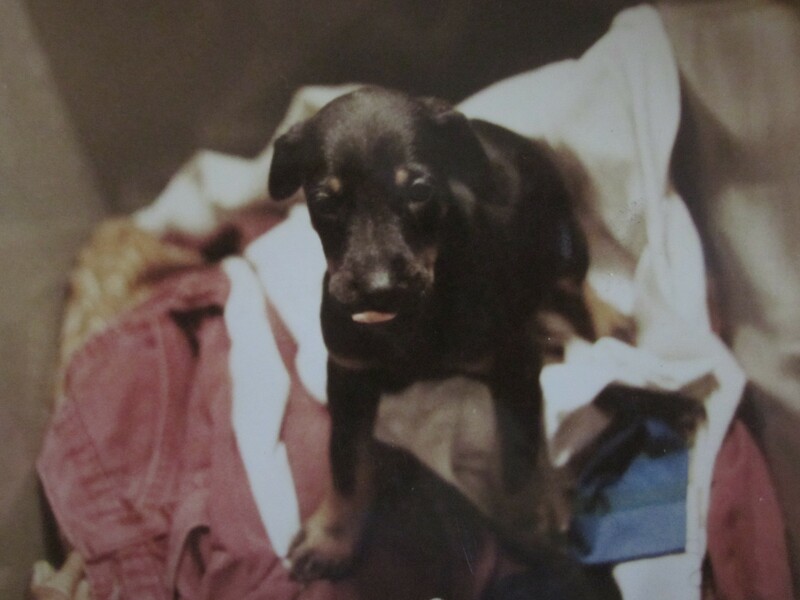 I often have trouble remembering how small and vulnerable I was as a child, especially because I was tall for my age, but thinking about those puppies reminds me what vulnerability really is. Even the wiliest of the puppies was in no position to truly protect herself. She could try. She could fight. She could put everything she had into saving herself. But if someone wanted to squash her, she’d be squashed. For some reason, maybe especially in America, adults want to imagine that children are the superheroes they pretend to be. Children can call 911, climb out of burning buildings, save the dog, if only they would apply themselves. I remember a dream where I am standing in a living room, in front of a bay window, at night. There are cages full of the tiniest puppies I’ve ever seen, but they have no newspaper or mats in the cages and I’m worried that they are going to fall through the slats of metal. I’m there to save these puppies. I am planning to take the cages with me to a better place, though I can’t picture that place in the dream. As I pick up the first cage, it’s too unwieldy and I lose my grip on the cage. This is when the dream goes into slow motion and I watch as the puppies are torn apart as they fall through the sharp metal bars of the cage to their deaths. I went there to save them, and I killed them instead. 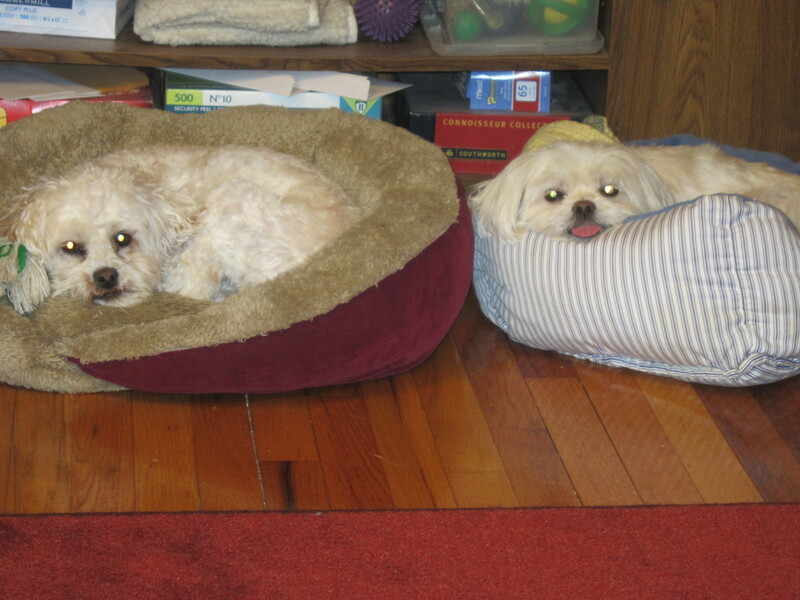 The dreams are so dark that I feel like a terrible person, hopeless, and useless, until I wake up, because my real dogs are barking at me to take them out to poop. Which is an incredible relief. I wonder what they dream about. 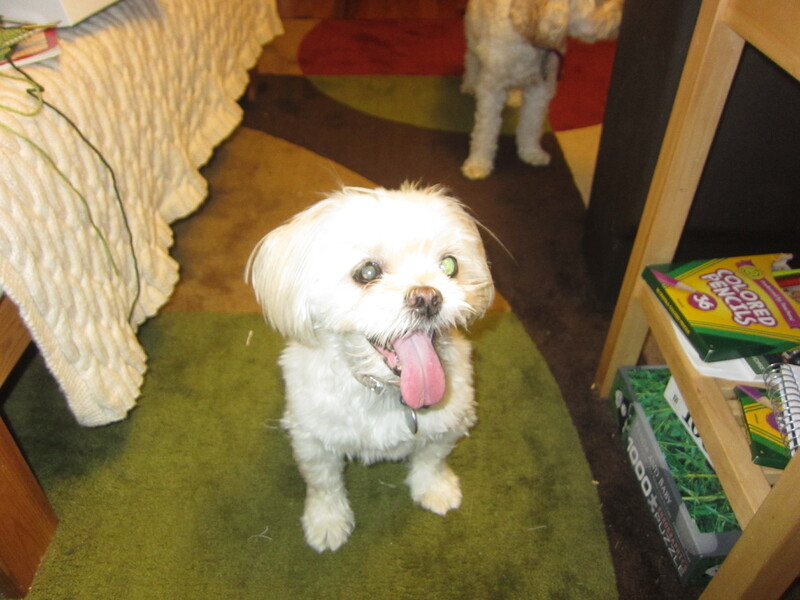 Posted in dogs, memoir and tagged dogs, dreams, memoir, pets, puppies. Bookmark the permalink. Butterfly is diabetic, and she has created a ritual for her morning blood test. She sees that I am going to the shelf where her testing kit lives, and with great excitement she runs to the hallway. She makes sure that I can see her, and then runs a few feet away, and then she turns back to check on me, to make sure I’m following her. She makes a dance of it, turning back three or four times down the fifteen foot hallway, bouncing on her toes in between twirls. Then she lands at her bus stop in Grandma’s room. And I mean lands. She flattens herself into a down position and waits for me to pick her up. Then I carry her back to the living room, sit her on my lap, and start the testing procedure. At first, when it came time to pick up Butterfly for her blood tests, Cricket would escape to her apartment under the couch. She was very concerned that this blood testing idea would spread, like a virus, like a bath-giving, haircutting virus. But over time she started to notice that not only was Butterfly the only target for the needles, there was also a very reliable treat give-away after the test. So Cricket began to sit by my feet as Butterfly’s blood was tested. I even caught her sniffing the testing kit once, as if she could smell the chicken treats by association. We take blood twice a day from Butterfly’s tail. We tried the veins in her ears, and her paw pads, and the callus on her elbow, but none of them worked, and then I saw a YouTube video of a dog getting her blood tested from her small cropped tail. Butterfly’s tail is long and skinny, so I wasn’t sure if it would work the same way, but there’s blood available every time and it doesn’t seem to bother her, much. Her insulin shot goes into the scruff of her neck and usually doesn’t bother her either, but sometimes I hit the wrong spot, or maybe the cold temperature of the refrigerated insulin bothers her, and she flinches. But it’s over in a second and then she’s ready for treats. She never runs away or growls or tries to bite me. Thank God all of this isn’t going on with Cricket. I’d have no fingers left. If Butterfly’s blood sugar is low, which it often is in the morning, she gets a special bone treat, made with whole wheat flour to raise her blood sugar just enough. 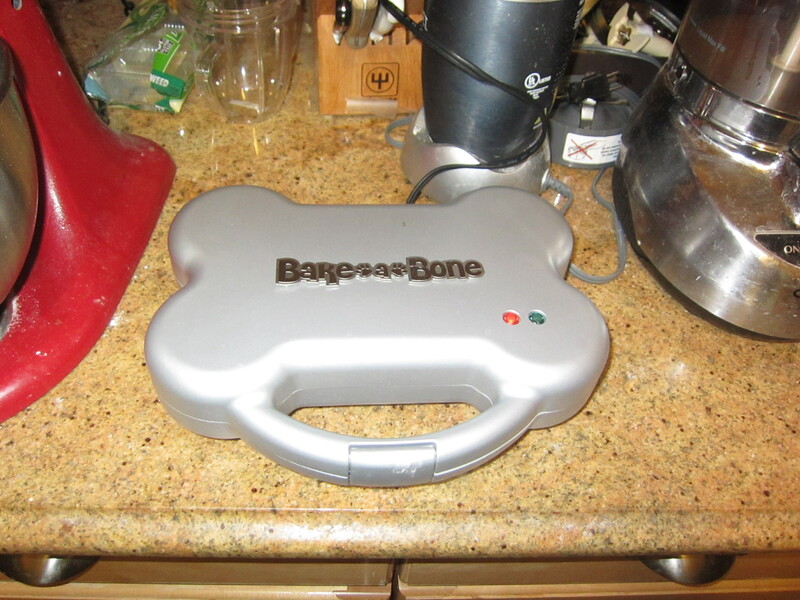 Mom got this Bake-A-Bone toy for Mother’s day or her birthday this year from my brother’s family, along with books of recipes for special foods for dogs. I think Butterfly has been talking to their dog, Lilah, and trying to influence the gift choices over there. The magical bone making toy. But if the blood sugar is normal-ish, or high, the girls share a chicken treat. They know where the bag is. They go straight over to the book case and stare up at it. Cricket has even tried to climb the shelves, unsuccessfully. They pull out all of their circus dog tricks if the treats fail to come as quickly as desired. Even Butterfly has learned how to stand on her back legs with her front paws in prayer pose, though she can’t maintain the pose as long as Cricket can. Then Butterfly takes her share and runs to the hall to eat alone. And Cricket inhales her treat whole, coughs a bit, and then stares at me expectantly as if I never gave her a treat at all. The other day, in the middle of the afternoon, Butterfly had a partial seizure. Her eyes started twitching, her legs wobbled, she walked in circles and couldn’t see clearly, and her body shook. When I calmed down, I tested her sugar and it was very low, the lowest it had ever been. We gave her maple syrup – applied to her gums the way the doctor told us to do, so she’d have no choice but to take it in – and within thirty seconds, she was herself again. Her doctor warned us about listlessness and even coma, but he never mentioned partial seizures, so thank god for doctor Google. And Now Butterfly is back to normal. I can be sitting on the couch, or at the computer, or trying to sleep, and she’ll come over as if something very exciting is about to happen. She’ll dip her head and smile at me, and then she’ll run. 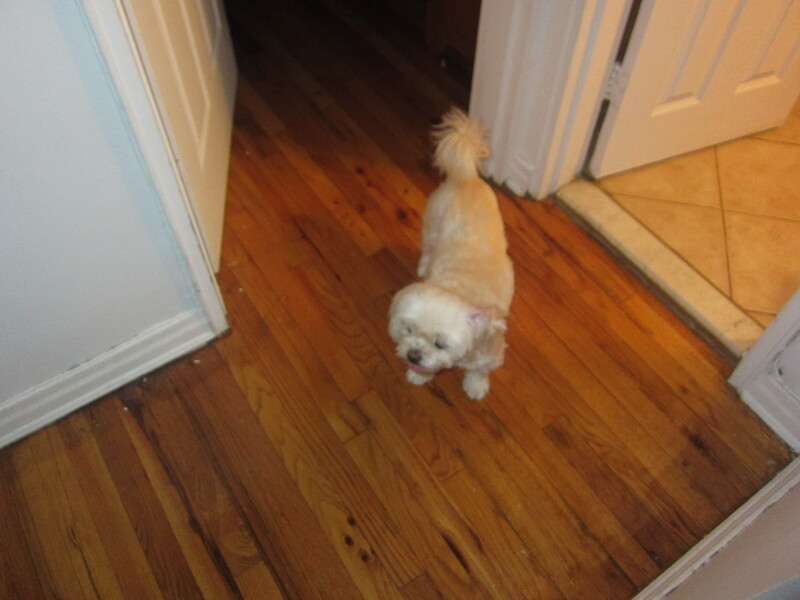 If I’m too slow, she waits for me, every step of the way, because she wants me to catch her. She wants to flatten out on the floor and get scooped up like a rag doll. It’s her favorite thing, chicken treats or not. 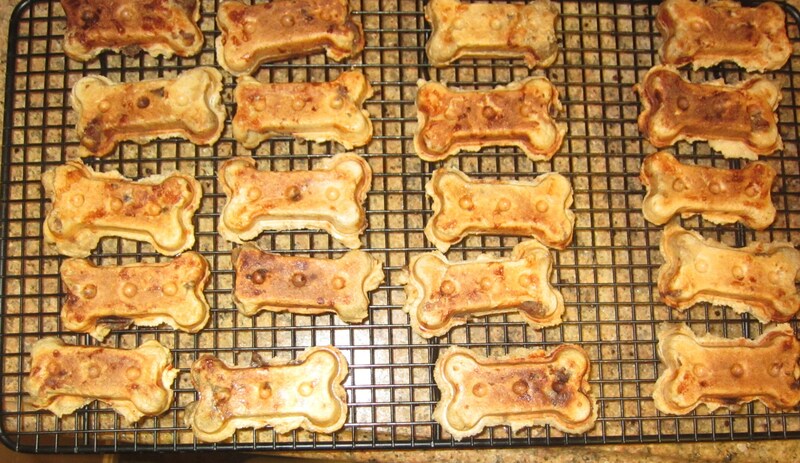 Posted in dogs, memoir and tagged Butterfly, chase, chicken treats, diabetes, dogs, memoir, pets. Bookmark the permalink. Cricket has been giving me the evil eye more often lately. She sits in her dog bed and rests her chin on the edge and stares at me. She jumps on my bed, climbs on my chest and stares. She especially crawls under her couch, looks up at me, and stares. I have started to imagine the letters Cricket would send me, if she could write. You have been using too much of my blog (The Cricket Pages!!!!) to talk about Butterfly. I am cute too. I am exciting and interesting and doing lots of great stuff. So, stop being a doodie. 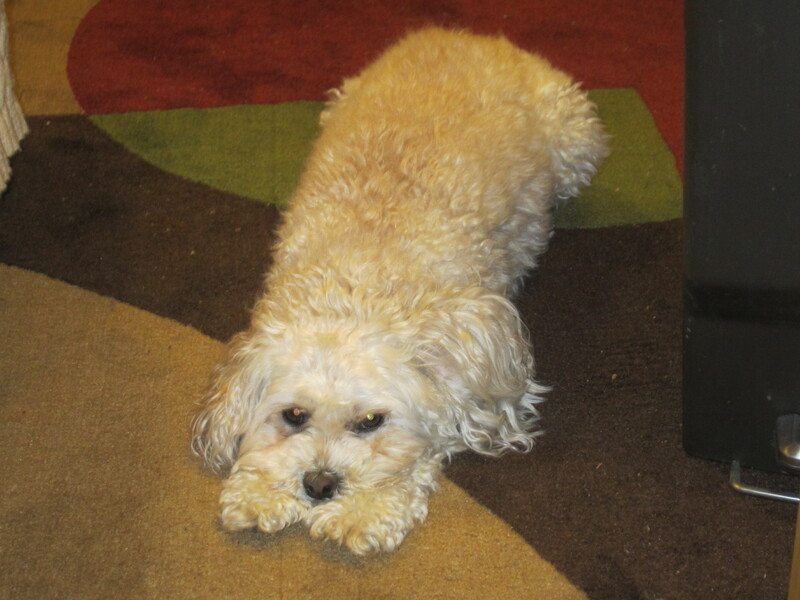 I’ve tried to explain to this imaginary Cricket that early on, the blog was entirely about her, but I’m afraid this would not go over well, and she would begin to reminisce about the good old days of being an only dog. The fact is, with all of the health stuff Butterfly and I have been going through lately, we haven’t been focusing enough on Cricket’s need for adventure. We’ve almost entirely given up on training. 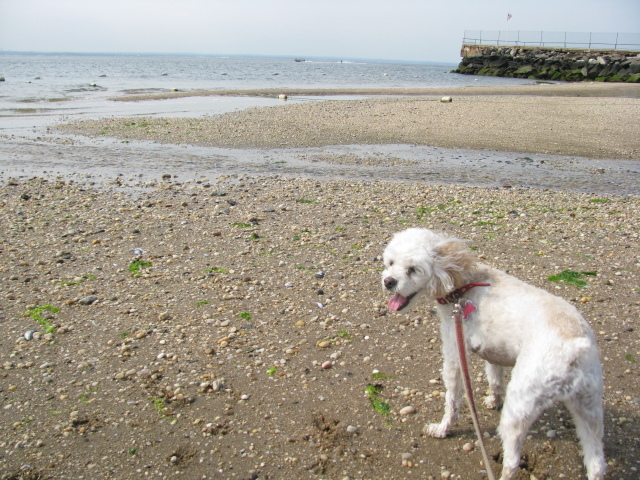 Cricket hasn’t been to the beach or been able to run full out or even been able to go on her long walks. Her resentments must have been seething under the surface for quite some time. Have you seen how high I can jump? And I don’t need shots or blood tests and I only bark at really important stuff, like dangerous intruders trying to kill my family! Write about me! I’ve been trying to think of potential blog posts that would be all about Cricket. Maybe a post about her tiny stump of a tail, and how she uses it to communicate alternate messages to the looks on her face. She can’t send mixed messages verbally, the way humans can, so she has to make do with mixed body language. But that’s not a whole post, and it might lead to rhapsodies about Butterfly’s long plume of a tail, and the way it dances in circles and swings like a fan dancer. Clearly a danger zone. If I had more energy, I could take her on some adventures just for her. Cricket would love to go on another car trip, or to fight with seagulls at the beach, or to a lake to meet some frogs or turtles. She’d love to go to the duck pond and chase the geese, as long as she wouldn’t fall into the water. She’d like to go on long walks and sniff new things. 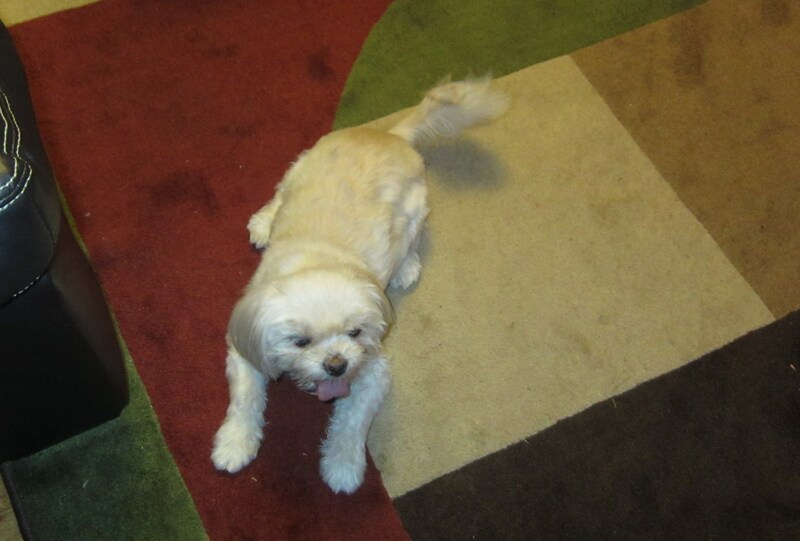 But she would not like to go to a training class, or to the vet or the groomer. She’d love to go to Petco to find treats and toys and other doggy smells, but not if it meant trying on outfits. She especially likes to poop on the floor there. I would love to be able to send her to school for half a day. She could have gym class and meet new dogs and learn to read, of course. And that would be a rich source of new blog topics, about her athletic triumphs, and social anxieties, and public speaking disasters. And then she could come home exhausted and not give me so many dirty looks for the rest of the day. This is a very good idea. This is the next thing we should be doing in America: public school for dogs. In the meantime, I did find something fun for Cricket to do closer to home that fulfills her need for excitement and lends itself to pictures for the blog. Her favorite poopy area in the backyard has been getting crowded out by weeds, and Cricket loves to battle weeds. 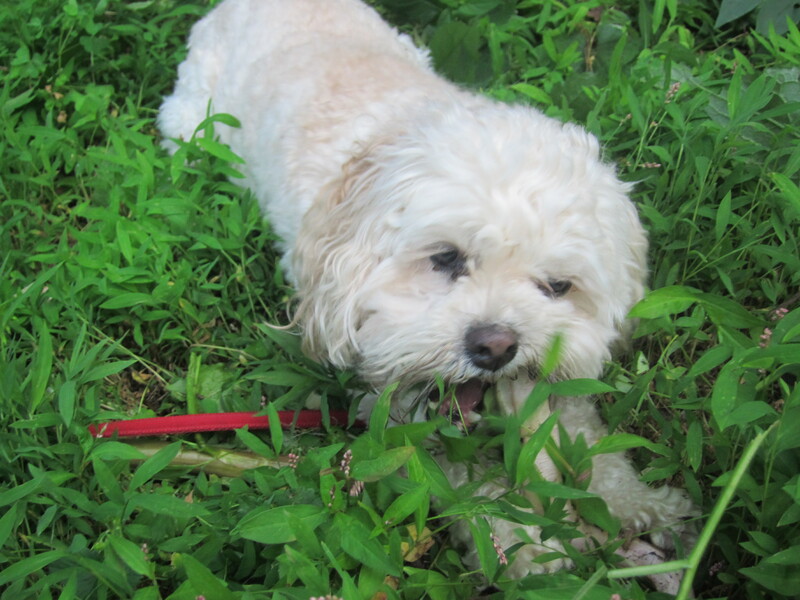 All I have to do is pull one or two weeds up to show her the way, and she sticks her head in the ground and searches for more roots and digs and bites and steals the weeds and runs around in a frenzy. 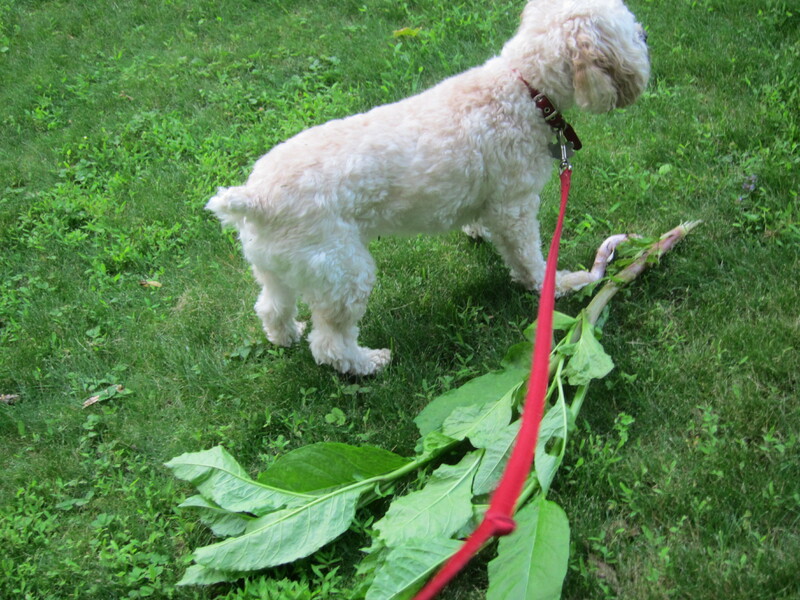 She especially likes the tall fat weeds that look like juicy green sticks. 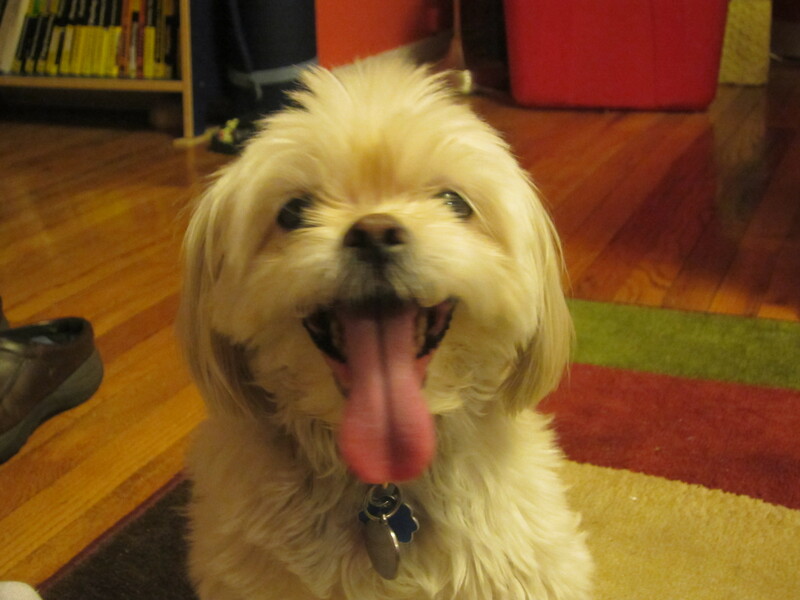 For minutes at a time, Cricket is unbelievably happy, and distracted. She comes back in the house with a smile and dirt all over her face and a light in her eyes. It’s a good thing we’ve been getting so much rain lately so that the weeds can keep growing and taking over the yard. The longer this Cricket happiness can last, the better life will be, for everyone in Cricket’s house. 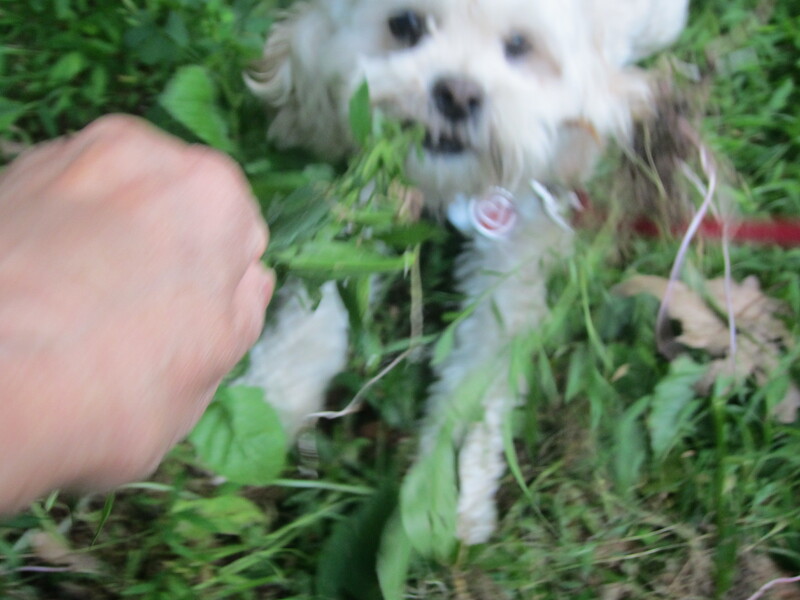 Posted in dogs, memoir and tagged dogs, gardening, memoir, pets, sisters, weeds. Bookmark the permalink.